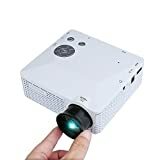 This projector has 60 lumens of brightness, so it is not recommended for school or business presentations, only for video games, home theater movies, children stories as well as education use. The projector’s brightness is designed for eye protection, so you won’t suffer any pain in eyes. This amount of lumens is not quite bright, but is definitely capable for children education or home cinema. If you want to connect the projector with your PC or laptop, you need to adjust the resolution on the screen display to the lowest, so the display resolution can fit projector resolution. 800×600 display resolution on this projector will ensure the best display results. The projector supports projection size from 20’’-80’’. The best projection distance is around 1.5m with projection size 35’’. The Crenova® XPE300 mini projector boasts gorgeous design, and its extremely portable size means you can easily take it anywhere with you. It is also very easy to use, and it rivals some of the best projectors regarding the connectivity and controls. One of the best advantages of this projector is the fact that it utilizes LED lamps which will never need to be replaced. One of the major selling points of the XPE300 is definitely its design. This slick looking, portable device definitely draws sights to it, and a great thing is that you can take it absolutely anywhere. The native resolution of 480×320 is expected given the price range, and you shouldn’t expect a remarkable viewing quality. The projector is not suited for business presentations either, not if you want to be taken seriously. However, it works just fine if you are looking to enjoy a relaxing evening with your friends or family (unless your friends and family are too demanding when it comes to picture quality). Two glass lenses and six layer coating significantly increases clarity and transparency. 60 lumens of brightness output is comfortable on the eyes provided that the room projector is set up in is the right size. In really small rooms, it can be too bright and cause a strain on the eyes. The life cycle of the lamp, according to the manufacturer, is up to 30000 hours, meaning that you should never have to replace the lamp, while the energy saving technology saves up to 70% energy. Playing video games can be a satisfactory experience if you do not stretch the image too much, though if you want the experience that’ll leave you in awe, you should avoid this device. Connectivity-wise, you shouldn’t find yourself in need for extensions, splitters or converters since the device features AV, USB, VGA, HDMI and SD card port, and speakers/headphones output.